When a domain is registered, the WHOIS database shows the names and addresses of .uk domain registrants. However, it does not show any other personal information such as email addresses or telephone numbers. The WHOIS database is available for everyone to view and some people may wish to opt out of having their address shown and consequently .uk WHOIS privacy options are available to allow private individuals to opt-out. Domain privacy is provided when a new domain is being purchased or this can be added later. The first step is to log into your 'Client Area'. Enter your email address and password into the respective login boxes then select 'Login'. Select 'Domains' from the top menu followed by 'Register a New Domain'. Enter in your new domain name and choose the domain extension from the drop down menu (only .uk domains can have whois optout). Select 'Search' to see whether the domain is available to register. If the domain that you've chosen is available, you should see confirmation about this. Choose how long you'd like to register the domain for and continue further down. You will find that the system will provide any other domains that you might be interested in that are similar to what you have selected. If any are of interest, tick that respective option and choose how long you'd like to register that for. Choose 'Continue' to move forward. 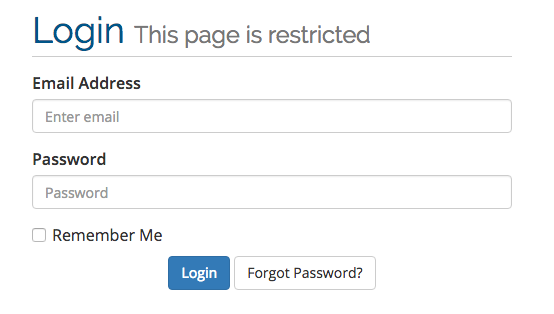 Near the top, enter the 'Registrant Name' and then tick the 'WHOIS Opt-out' option. This will mean that the name will be shown when a WHOIS request is made on the domain but no other details will be shown. 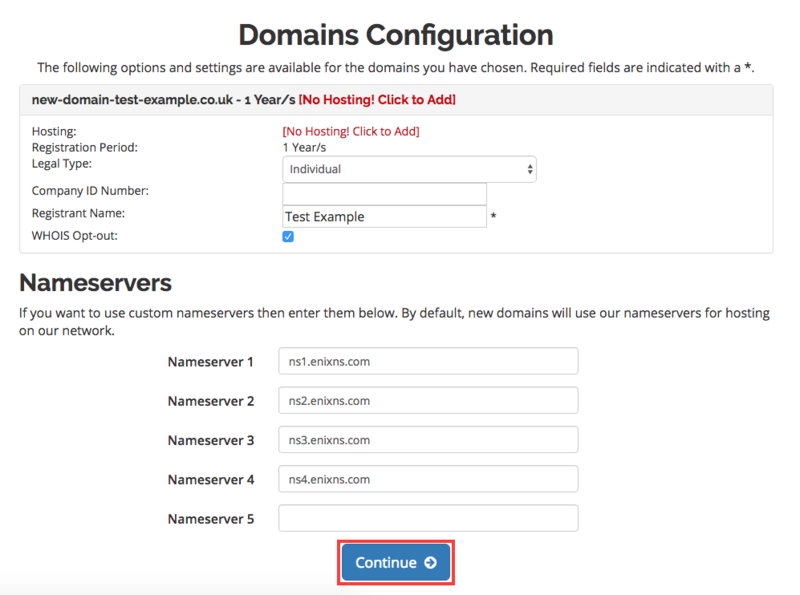 Configure the nameservers for the new domain. 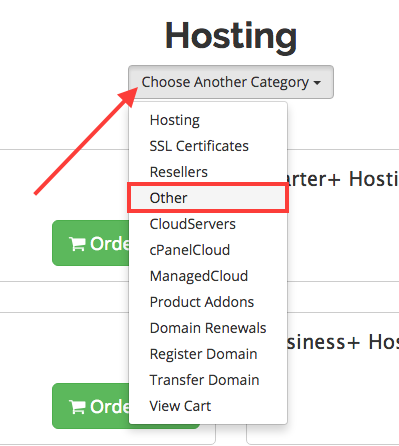 By default, the nameservers for the site's hosting network will be shown. If you want to use custom nameservers, please change these accordingly. The details of your order at this point will be confirmed on screen by showing the items in your cart. If you are happy to continue, scroll further down. 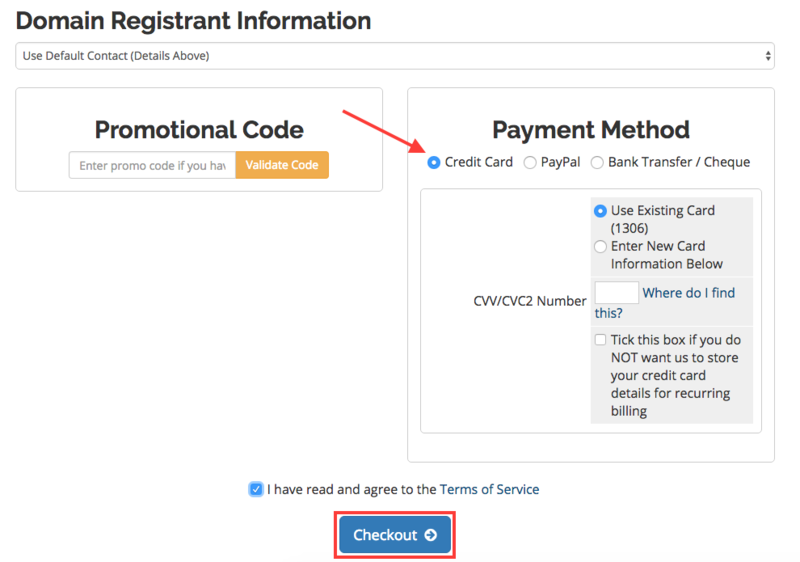 Review your registrant information and then select your 'Payment Method'. To complete, select 'Checkout' to register the new domain. Please note - once the registration of the new domain is complete, you will be able to manage it via the 'Domains' -> 'My Domains' section of the Client Area. Please allow up to 24 hours for the nameservers to update before accessing the new domain via your web browser. To add domain privacy to an existing domain that you have on your account, order the new service as follows. Log into your 'Client Area'. Enter your email address and password into the respective login boxes then select 'Login'. 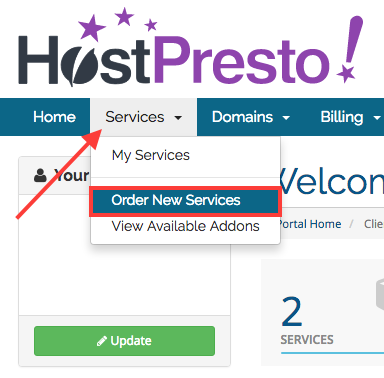 Select from the top navigation menu 'Services' followed by 'Order New Services'. Select to expand the product options menu and choose 'Other'. On the 'Domain Privacy' product, choose 'Order Now'. 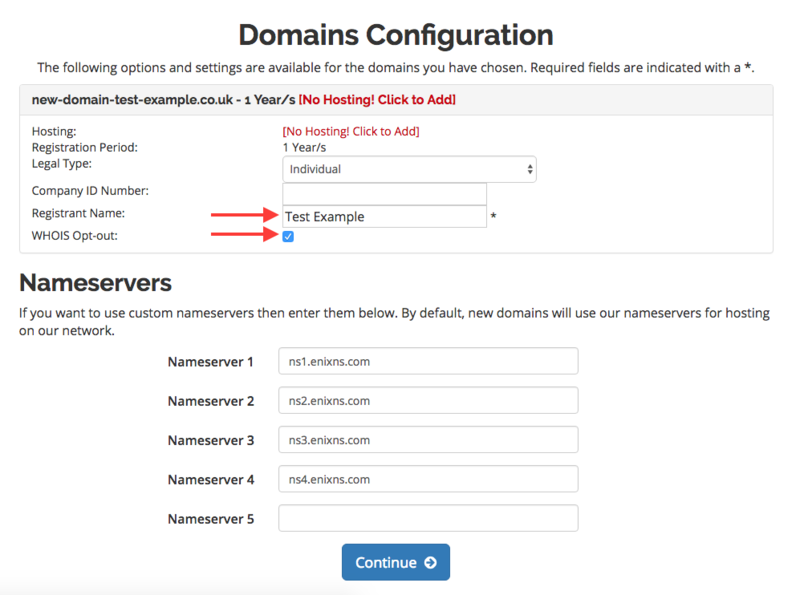 To add to an existing domain, choose the 'Keep domain with current registrar and update Nameservers / DNS'. Type in your existing domain and extension into the respective boxes. Review the new product and sanity check the domain entered is correct. Choose your preferred 'Payment Method' and complete the process by selecting 'Checkout'. This article has provided information regarding how you can either order a new domain with domain privacy and add domain privacy to your exising domain. 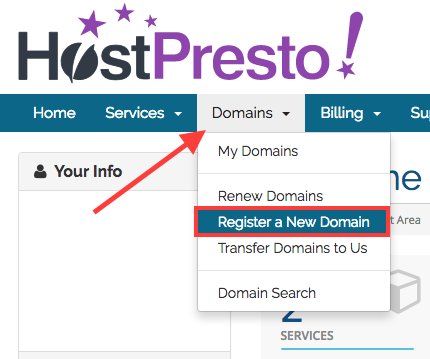 How to Transfer a Domain to HostPresto!